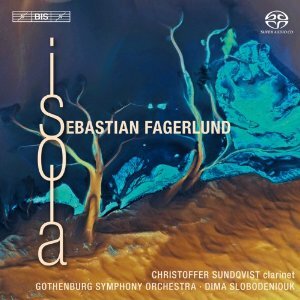 I really enjoyed Sebastian Fagerlund's previous disc on BIS, so much so that a long extract from my review of it appears in the liner of this one. I'm not quite as excited about this second offering, although the music is in a similar vein. The previous release was an opera, and Fagerlund's style has a lot to offer that genre. There is an immediacy about his music that is all too rare among contemporary composers. In the context of an opera, this allows his music to evoke contexts and moods efficiently, and to change direction as swiftly as the drama. Music for the concert hall doesn't need that flexibility, at least not to the same extent, and the approachability of Fagerlund's sounds, that prevents his operatic work from becoming pretentious or self-indulgent, here tends towards populism. The Clarinet Concerto is the most successful work here, perhaps because, like opera, there is a certain utilitarian dimension to concerto writing. The solo part is impressively virtuosic, while the orchestral writing manages to be colourful while always supporting the soloist. Technically, there is nothing particularly new here, but the way in which certain performance techniques – slides, growling, that sort of thing – are woven together into a coherent structure is impressive. You'd think that all those slidy portamento textures would evoke Gershwin, but the music is more reminiscent of those central Asian composers who write music based on the folk music of parts, usually for the Kronos Quartet. The concerto is in four movements, separated by intermezzos, the last of which is a cadenza, a form all too neglected in modern concerto writing. The piece is beautifully played by its dedicatee Christoffer Sundqvist. I was surprised that the piece had not been written for Kari Kriikku, like the concertos by Lindberg, Saariaho and Salonen, but given the extraordinary quantity of musical talent coming out of Finland, perhaps it shouldn't be a surprise that there is more than one clarinet soloist there specialising in contemporary music. The other two works on the disc, Partita and Isola, are orchestral show-pieces. Several writers have attempted to contextualise Fagerlund's style of orchestral writing on the basis of this disc. The liner note mentions Saariaho, Lindberg, Aho, Nordgren, Rautavaara and Wennakoski. In his Gramophone review, David Fanning adds John Adams, James Macmillan and Lutoslawski. The difficulty is in pinpointing the audience-freindly nature of this music. Certainly Magnus Lindberg seems the closest of the Modernist Finns, but this music is not as gritty or relentless as that. On the other hand, it has a sense of openness and breadth that could perhaps by linked to Rautavaara, although without the spirituality. Sibelius is certainly in there, but only as a distant ancestor. Then there is American minimalism, and I think it is fair to evoke John Adams as a direct influence on the ostinato textures of Isola. I just find it all a bit too friendly, which is uncharitable given the sheer invention in this music and the skill with which it is orchestrated. As you'd expect, BIS make sure that the music is presented in the best possible light. The Gothenberg Symphony are on top form, their job helped considerably by Fagerlund's understanding of the instruments he uses, including the large percussion section. I recently read a list of the BIS releases for the coming month, and out of seven discs, four are SACDs. It is great that this audiophile label is continuing to support the format, and that the recordings they put out on it are consistently worthy of the technology. The SACD sound here is excellent. It is of particular benefit to the soloist in the concerto, whose dynamics stretch to both extremes. The clarinet sound is beautifully reproduced, with a real sense of presence and textural depth. All round, an interesting release, showing another few dimensions to Sebastian Fagerlund's art. But to hear what he is really capable of, I'd still recommend his opera Döbeln as the first port of call.